If you know companies looking for dedicated or converged storage, we would like to offer you a chance to participate in our Referral Bonus Program. Help us expand the StarWind family by referring a colleague who can benefit from using StarWind solutions and whose business problem we can solve. 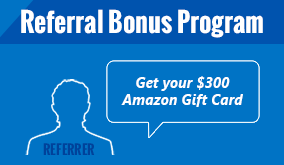 Fill-out the registration form and get $300 Amazon Gift Card for every introduction that will result in a deal..